When coding professional evaluation and management (E/M) codes, CMS gives the option of choosing either 1995 guidelines or 1997 guidelines. The difference between the two is the physical exam documentation. Specialized providers prefer 1997 guidelines since their physical exams are more focused (i.e. podiatry, OB/GYN, etc.). Emergency room providers typically prefer 1995 guidelines as their physical exams are more generalized. After looking at the MDM and determining the level, the coder will count up the elements per the CMS guidelines. Each chart is broken down into sections (HPI, ROS, PFSH, and PE). Each section has a certain number of elements that needs to be documented. Even though the MDM drives the level, the number of elements has to be documented in order to assign that level. If the documentation is not there to support the level, then you have to down code to the level that the documentation does support. The facility E/M level is determined by the highest level of intervention that is provided to the patient during their ER stay. The interventions include, but are not limited to, diagnostic tests performed, medication administration, discharge instructions, etc. CMS does not provide guidelines when it comes to determining the facility E/M level. Each facility can create their own E/M matrix. 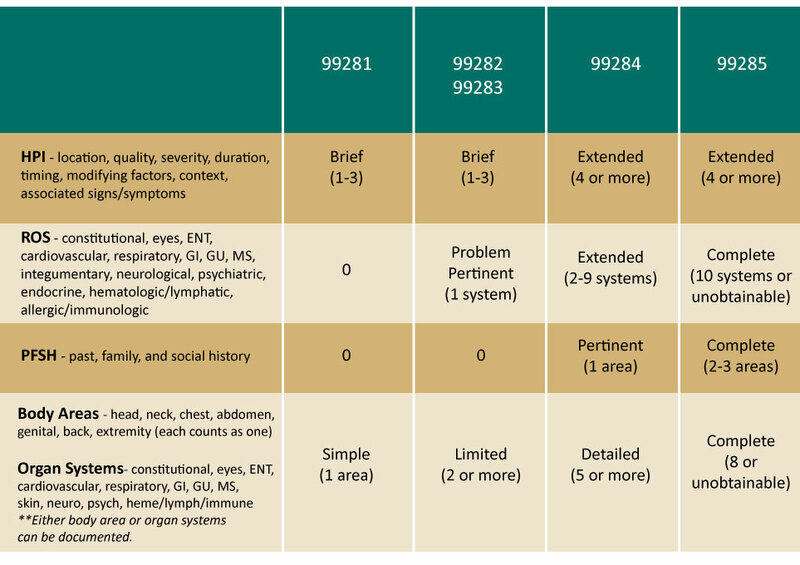 To see an example of a facility E/M matrix, please click on the American College of Emergency physicians resource: https://www.acep.org/content.aspx?id=30428.